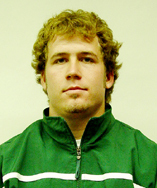 Gerleve Throws Javelin Career-Best 197'8"
ENMU Athletics News Press Releases 2006 Archive 5/15 Gerleve Throws Javelin Career-Best 197'8"
ABILENE, TEXAS — Eastern New Mexico University track and field athlete Zach Gerleve (Jr., Javelin, Truth or Consequences, NM/Hot Springs HS) threw the javelin a career-best 197’8” at the Abilene Christian University Open on Thursday, May 11. Gerleve took second in the event behind unattached competitor Casey Pearce, who toss the javelin 210’0”. Eastern’s Logan Capps (Fr., Javelin, Cloudcroft, NM/Cloudcroft HS) took third place in the event, with a throw of 170’7”. Gerleve’s previous career best was 196’4” at the McMurry University Indian Relays earlier this season on April 6. That throw allowed him to pass the provisional qualifying mark (195’0”) for this year’s NCAA Division II National Track and Field Championships. Gerleve added more than a foot with his top throw at the ACU Open to improve his chances of being selected for the National Championships. He is ranked 23rd in NCAA Division II pending other results from the past week. He may still need to reach the 200-foot mark to move up in the rankings sufficiently to secure a spot at the national event. He will get one more shot at improving his career distance when he competes at the McMurry University Twilight Meet on Thursday, May 18. Prior to the ACU Open, Gerleve had won every meet he entered this spring, except for the Wes Kittley Open at Texas Tech, where he placed third on March 24. Gerleve also claimed his second consecutive Lone Star Conference title in the javelin this spring with a throw of 192’ 6 1/4” on Saturday, April 22. As a provisional qualifier, Gerleve is in a pool of potential competitors for the National Championships, set for May 25-27 in Emporia, Kan., but he isn’t guaranteed a spot. The number of provisional qualifiers who compete at the national meet will be determined by how many athletes achieve the automatic qualifying standard of 218 feet, plus the relative competitiveness of the provisional qualifying pool. Meet coordinators try to find a cutoff point that will include athletes who are competitively matched with the rest of the field. Displays the date and time of the last update.